On SPIDER, one of two testbeds at the ITER Neutral Beam Test Facility, the negative ion source for ITER's heating neutral beam system will be demonstrated at full project specifications. 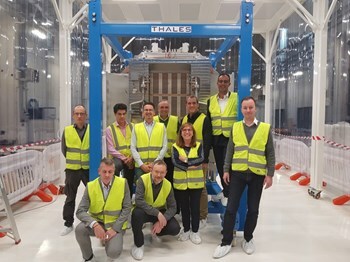 With the recent arrival of a component procured by the European Domestic Agency—the beam source—the test bed is that much closer to completion and operation. At Consorzio RFX in Padua, Italy—home to the ITER Neutral Beam Test Facility—assembly and installation activities for the SPIDER* test bed are progressing well. SPIDER will help engineers to finalize the development of the ion sources required for ITER's two neutral beam injectors, powerful devices that will inject a total of 33 MW of heating power into the ITER plasma. 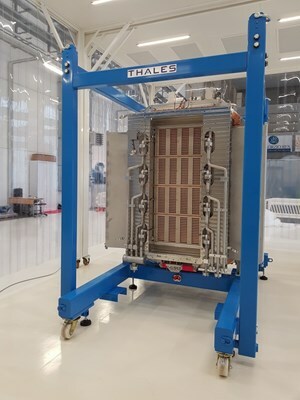 A second testbed, MITICA, will test and optimize the full prototype 1 MV injector, including beam source, accelerator, and beamline components. In an important industrial milestone, a European consortium involving Thales Electron Devices SA (France), CECOM Srl (Italy), Galvano-T GmbH (Germany), and E. Zanon SpA (Italy) has manufactured and delivered the SPIDER beam source—a component weighing about 5 tonnes and measuring 3 x 3 x 2 metres. The beam source will be installed in a large vacuum vessel with the help of a sophisticated handling tool—components that were also developed as part of the same contract issued by the European Domestic Agency. This is the first full-scale ITER ion source, capable of running pulses of up to 3600 seconds at maximum power with hydrogen or deuterium. The 6 MW generated by this beam source in one hour are equivalent to the energy required by roughly 1,000 medium-sized apartments in one day. As a matter of comparison, it is twice as big as the largest existing beam source, ELISE, operating at the Max Planck Institute for Plasma Physics, in Garching, Germany, as part of a wider step-by-step effort to develop the heating system that will contribute to bringing the plasma of the ITER test reactor to a temperature of many million degrees. ITER's neutral beams are based on the acceleration and subsequent neutralization of negative deuterium (D-) ions; although neutral beams are routinely used in tokamak devices as the "workhorses" of auxiliary heating, ITER's will be the first high-energy beams at 1MV based on a negative ion source. See the full report, plus a video clip of component assembly, on the European Domestic Agency website.